It is easy to point out that the stories we tell each other are, at least in part, signs of the times in which we live. Our fears and dreams play out in fictions that we tell ourselves are not real but which rely on plausibility and relatability to drive their observations home. But less common, and I think more poignant, are those stories that do not pass judgment on the scenarios they present. Mighty Mighty is such a story. Within the pages of Mighty Mighty, questions about class, race, justice, parenthood, siblinghood, friendship, sexuality, escapism, faith, honor, responsibility, and fate appear constantly and without reservation. The text shows no fear or reluctance in showing the foul sides of its characters and of its setting. The story presents itself in effective language that is meant to put the gravity of the circumstances in the most direct terms. And amidst this stoic delivery, achieves its most impressive feat: it never insists upon itself. It is unfortunately common for stories like this to become preachy, existing as little more than soapboxes for their authors. Mr. Rudolph lets his story tell itself, never asking us to cheer or deride his protagonists, never telling us how we should feel as events unfold. The reader is presented with people that feel very real in their virtues and their flaws and then left to come to their own subjective conclusions. 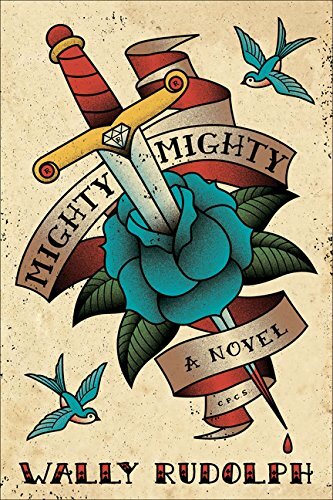 Of all the stories I have reviewed, I find Mighty Mighty the most difficult to discuss without revealing too much information. I specifically chose not to sample the most quote-worthy material for this review precisely because the language is used so efficiently that any quotes could be major spoilers. This is an ensemble work, with a cast of characters that would easily be at home on The Wire or in a Dashiell Hammett novel, and they truly are the strength of the novel. The manner in which their stories repeatedly interweave and jettison away from one another is completely engaging and keeps a pace that, when combined with the use of language, allows the reader to devour the story. Any reader with a modicum of experience knows that the tales of the various characters presented are going to intersect on some level and at some point. But the delivery of information, the sequencing of events, and how Mr. Rudolph subtly plays with time are handled so well that neither the ending nor the critical points along the way are revealed before their time. People often complain about the lack of unique stories available to them, and to them I would hold up Mighty Mighty as a stellar example of how a story can be familiar and refreshing; of how a story you think you have heard before can be told in a thoroughly effective and engaging way. I dare to say that most of us are at a crossroads with the social issues that Mighty Mighty presents: the supposed virtue or vice of the police, the moral standing of those who some call addicts and others call junkies, crime and culpability, etc. This novel provides something all too precious at such crossroads: conjecture and discussion without the screaming and the shouting. It is a thoughtful and evocative questioning of assumptions and beliefs that are overdue for such attention. And that questioning is anything but rhetorical. Mighty Mighty is available now through Soft Skull Press.